The alphabet of syllables is used all over the world. Yet, one hundred years ago, as he whittled away with his jack-knife, making these symbols in the wilds of northern Manitoba, James Evans could hardly have dreamed it that way ... or could he? For undoubtedly James had vision and the will to make his dreams come true. This remarkable man was born at Kingston-upon-Hull, England, January 18, 1801. Living near the ocean, he, as a child, was fascinated by the water and wanted to be a sailor. His father, however, although himself a captain of a merchant vessel, didn't want his son to be a seaman. When he was eight, his father took him on two Baltic voyages, rough ones ... and after that, neither did he. James attended a boarding school until he was fifteen and was then apprenticed to a grocer. In time, the Evans family migrated to Canada and two years later he joined them at LaChute. Here, in Lower Canada, he began teaching school and he met and married Mary Blythe in 1823. In the autumn of 1828, he was engaged to teach in the Indian School at Rice Lake; so called because large quantities of wild rice grew in this area twelve miles north of Cobourg, Ontario. 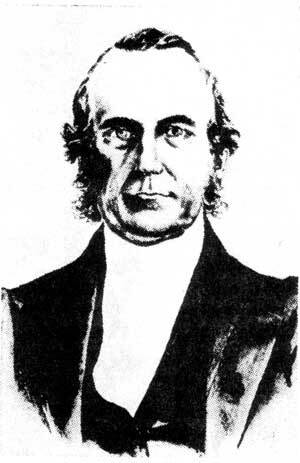 An apt linguist, Evans soon learned the Indian tongue, and, now considered a missionary as well as a teacher, he translated portions of the scripture and hymns. Though completely happy in the log house which he built himself, the Evans family was very poor. A visitor recalls that Mrs. Evans mixed flour and fish (their only food) for the meal he had with them. After a year and a half at Rice Lake, Evans was received on probation for the ministry. "Burning with a zeal for the souls of men," he taught the children, toiled in the fields with the men, and translated and preached the gospel. In 1831, he was sent to the Credit Mission, then on to Hamilton where the Indians also caught the enthusiasm of the devoted missionary. Earlier, with three other men, he had prepared an Ojibway translation of the Bible. Now, he was chosen to superintend the publication of it in New York. About four months before the work was completed, he wrote a cheery letter to his wife telling her: "I'm as fat as a beaver and as nimble as a deer. Let Clarissa oil the joints of the fingers of her left hand eleven times a day, so that they may be limber enough to beat me playing the accordion." He adds to his daughters: "Be good girls (I miss you both) and try to make Mamma happy ... Keep a good fire as I shall be creeping in some evening very cold. "And no wonder for, on his journey home from New York to Toronto, having booked deck passage, he slept three nights on the softest plank he could select. After being ordained, he was constantly on the move throughout Western Ontario. He often crossed the St. Clair River to preach to the American Indians encamped there. On one of his expeditions, though the Indians loved him (no one could manage them like Evans), he was suspected of being a Canadian spy and was closely watched. Nevertheless, his fearless spirit and natural courage sometimes approached recklessness, such as the time he was on his way home to Sarnia after a meeting he had attended. Reaching London laden with stores purchased in Toronto, he discovered that, owing to the river being in flood, not a single conveyance could be found to take him the rest of the way home. Never daunted, Evans bought some siding and other necessary material, built a raft and on it "packed his traps." After decking it over, he launched the crazy contraption and set out on the turbulent waters of the River Thames. Apparently heedless of danger and difficulties, along the river he sped! Over rapids and mill-dams, past all obstacles with paddle and rigged-up sail he was hurried on until Sarnia hove in sight. Home at last ... intact. May 12, 1840 finds him journeying still farther afield  this time his destination Norway House, one of the Hudson's Bay Company posts in Northern Manitoba. He arrived the first week in August and because of his previous training was able to begin his work at once. He spent his first winter at the post and in the spring he resolved to locate his mission about two miles away at Rossville, named for the Chief Factor of the post, Donald Ross, with whom he developed a strong friendship. In a letter he says: "... the timber of the Rossville Church was all growing in the wood on Tuesday last, and the building was completed on Saturday evening." Just in time for church next day. His church finished, Evans was free to make arduous and lengthy trips to visit his scattered parishioners. Gliding swiftly over the northern rivers and lakes in his ingenious tin canoe, he seemed to revel in hardship and danger. Because of the flashing brilliance of his canoe made of sheets of shining tin, the Indians christened the craft, the "Island of Light." In it the missionary ran the swiftest and wildest rapids, crossed the lakes in violent squalls, and though hundreds of miles away from home sent frequent letters written on birch bark to his wife. Because of his achievements jealousy arose in certain quarters ... but not with the Indians; their loyalty never swerved. When he pursued his idea about birch bark Bibles they were eager to help, so Evans doggedly planned and brought to perfection his syllabic alphabet. In less than one year he devised the syllabic system upon which his enduring fame rests. Then came the lessons. On the birch bark collected by the Indians Evans scratched the Cree signs with a charred stick for them to learn to read. Always a hustler, this way seemed too slow so he hauled out an old H.B.C. fur press and decided it would do to print with. Working harder than ever, whittling his type from the oak trees round about, he persevered. Anxious to help, the Indians brought him the best pieces of bark they could find; the "talking birch" fascinated them. Mrs. Evans, who had joined him, worked too, setting the wooden type for the hymn they chose, "Jesus my all to heaven is gone." Together they printed five thousand copies in four months, using ink made from chimney soot. A sixteen page Hymn Book followed their first effort. But one hundred copies, complete with deer skin covers, meant a great deal of whittling! To solve this problem he made moulds, casting his type from old bullets and the lead linings of tea chests. Today, only one of those little skin-covered volumes can be found. This treasure (just the right size to fit in a coat pocket) is stored in a vault in the Victoria College Museum in Toronto. In the Museum also is a little metal container with glass ends through which may be seen rectangular pieces of lead  the very "syllable" signs or symbols Evans used to print the original bark Hymn Books. The syllabic Hymn Books used today in the little frame church on the hillside near Norway House Sunday after Sunday have expanded to two hundred pages. Although James Evans died in England, November 23, 1846 and was buried there, in Canada a simple cairn on the shore of Playgreen Lake marks his memory. The tablet reads: "HE BROUGHT THE LIGHT," but the Indians like it their own way. They tell us: "James Evans was the man who made birch bark talk." We feel a word of apology is due some chapters who applied for charters which have not been sent out. They are being processed and will reach you very soon. In addition, some of our subscribers may feel that their correspondence has not received attention. A change in secretarial staff has resulted in some delay in attending to these matters, but our new secretary, Mrs. Bernice Bell, has matters well in hand now, and you may expect prompt attention in the future.